This is not some far-fetched fantasy of zealots who want to privatize our national parks. Actually, it’s a pretty close description of my own modest home—and probably yours too. I live just a few blocks from Lake Harriet, a national treasure where I x-country ski, swim, walk in the woods, picnic and spot bald eagles soaring through the skies. And all of this happens right in the middle of inner city Minneapolis. Lake Harriet, you see, is a Minneapolis city park—a part of the commons that belongs to all of us. Chances are good you’ve got something similar near your own home. It may be a wading pool and woodpeckers instead of a lake and eagles, but it’s no less of a treasure. City parks are your Yellowstone—a spot to relax and reflect and revel in nature as well as to enjoy a picnic or shoot hoops. They can also be the neighborhood version of New York’s Times Square or Washington’s National Mall, providing a gathering point where you run into friends and feel a part of the action. The local park is often the place where we celebrate local festivals, play sports, attend community meetings, join classes, and ooh! at fireworks on the fourth of July. I believe that local city parks—even humble ones with only a playground, flower patch, Little League diamond and benches beneath the trees—are part of our birthright as Americans every bit as much as majestic national parks. This is not meant in any way to minimize the wonder of our national parks, recreation areas and state parks—especially now that many of them face serious issues of upkeep and diminished funding. I will always remember the childhood thrill of clambering across a snow field during August high up in Rocky Mountain National Park or learning to body surf as a teenager at Cape Cod National Seashore. Even as a seasoned travel writer on assignment for Better Homes & Gardens magazine, I was spellbound by the experience of seeing a buffalo herd up close at Custer State Park in South Dakota. Each year my family and I count the days until our annual trek to the Apostle Islands National Lakeshore in northern Wisconsin, which I have come to look upon as a restorative retreat as much as a summer vacation. Yet these are once-in-lifetime—or, at best, annual—peak experiences. Lake Harriet and Minneapolis’s other fine parks are wonders that I can visit every day. And I often do, walking the dog after breakfast or biking around the lake in the evening. These parks are where my son’s soccer team played spring, summer and fall; where he learned to ice skate, sled, ski and sail; where he organized capture-the-flag tournaments and where his eighth grade graduation ceremony took place. My wife Julie and I visit Lake Harriet twice a day in the spring when the cherry blossomes and lilacs are in bloom, and we sit out on a blankets to hear jazz, folk, Latin, polka and classical concerts at the bandshell throughout the summer. 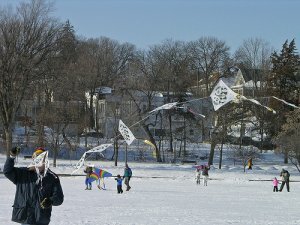 In the winter, no matter how cold, we turn out with hundreds of others to watch kites flying as part of an annual festival. Lake Harriet is part of the fabric of my life, woven through my memories and daily rhythms. I wouldn’t trade it for anything, not even a seven-bedroom beach house with the Atlantic ocean lapping at my front door in Acadia National Park. This entry was posted in Uncategorized on February 10, 2014 by citoyen1789.